It’s something that hasn’t been done before, a temple, a mosque and a church coming together to create a shared religious space. “It came because God wanted us to start something completely irrational,” joked Rabbi Aryeh Azriel. “The religions share the same ideas, the same truths and therefore they can work together and live together,” said Syed Mohiuddin. After September 11th, a friendship blossomed between Temple Israel Rabbi Aryeh Azriel and Syed Mohiuddin, the President of the American Muslim Institute. Azriel offered support to the local Muslim community. Soon after, Minister Eric Elnes of Countryside Community Church joined the mix. Then came the idea of a Tri-Faith Initiative. “There are still a few people who don't think this is such a hot idea,” said Mohiuddin. The new concept may be controversial to some, welcomed by many and even comedic to others. 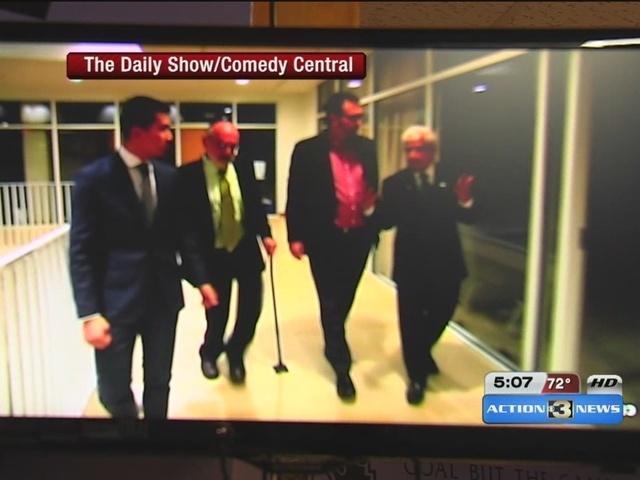 A few months ago the Tri-Faith Initiative caught the attention of Comedy Central’s The Daily Show. “Oh my gosh, why are they calling us, what are they going to do with this story,” said Azriel. The men were a little hesitant to film, but decided to share their story and a few laughs with the world. “If you can't laugh a little about yourself, then where is the faith? I thought it brought up the appropriate measure of hilarity and theology,” said Elnes. The Daily Show’s satire touched on many things including the possibility of the Tri-Faith Initiative being a target for terrorism. The religious leaders squashed that suggestion. “We feel like we are the best hedge against the very acts of terrorism. Not to say it can never happen, but how we are going to combat that is with love and ideas,” said Elnes. They are combating terrorism the same way they're able to make the Tri-Faith Initiative work, through love and ideas.